Deciduous woodland and nucleated roadside settlement with 18th- to 19th-century cottages, chapels and 20th-century housing, set around prominent, isolated limestone hill. Falling within the ancient ecclesiastical parish of Llanfair Dyffryn Clwyd. Prominent, limestone hill and crag with wooded slopes, becoming open towards summit, between about 100-189m. 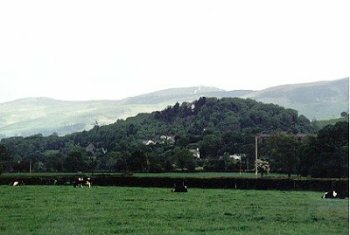 Nucleated settlement of 18th- and 19th-century stone-built detached and terraced cottages, two limekilns, two chapels, smithy, inn and farm of Tan-y-graig strung out along Wrexham to Ruthin road at the foot of the hill, with small 20th-century housing estate and isolated 20th-century houses and bungalows in the woodland towards the summit of the hill. Small enclosed pasture fields on the eastern sides of the hill, shown on the enclosure award of 1853. Limestone drystone walls with stone stile along roadside through woodland on B5429, the woodland of Coed Henblas being classed as ancient replanted woodland. Former smithy, limekilns and inn. Stone-built Ebenezer Independent Chapel, erected 1840 and stone-built Bethel Wesleyan Methodist Chapel rebuilt 1883 (founded 1845).